ALERT: Just noticed that my Twitter handle, which I changed to Menupause, did not work when I clicked on Twitter, so type in Menupause on Twitter, please. Will contact my web guru for help. Picture of Recipe for Kale with Garbanzo Beans to post tomorrow. …..Why is lettuce the only green vegetable that most Americans ever use, when green vegetables are recognized by nutritionists as one of the most inexpensive sources of so many important nutrients?…….Leafy vegetables are ideal for weight management as they are typically low in calories. They are useful in reducing the risk of cancer and heart disease since they are low in fat, high in dietary fiber, and rich in folic acid, vitamin C, potassium and magnesium, as well as containing a host of phytochemicals, such as lutein, beta-cryptoxanthin, zeaxanthin, and beta-carotene…..
Because of their high magnesium content and low glycemic index, green leafy vegetables are also valuable for persons with type 2 diabetes. An increase of 1 serving/day of green leafy vegetables was associated with a 9 percent lower risk of diabetes. The high level of vitamin K in greens makes them important for the production of osteocalcin, a protein essential for bone health. The risk of hip fracture in middle-aged women was decreased 45% for one or more servings/day of green, leafy vegetables compared to fewer servings. Green vegetables are also a major source of iron and calcium for any diet. (Swiss chard and spinach are not considered good sources of calcium, due to their high content of oxalic acid. Parentheses mine, es) Green leafy vegetables are rich in beta-carotene, which can also be converted into vitamin A, and also improve immune function…. Lutein and zeaxanthin, carotenoids found in dark-green leafy vegetables, are concentrated in the eye lens and macular region of the retina, and play a protective role in the eye. They protect against both cataract and age-related macular degeneration, the major cause of blindness in the elderly…. Green veggies contain a variety of carotenoids, flavonoids and other powerful antioxidants that have cancer-protective properties. In a Swedish study, it was reported that eating 3 or more servings a week of green leafy vegetables significantly reduced the risk of stomach cancer, the fourth most frequent cancer in the world. Cabbage, cauliflower, brussels sprouts, and broccoli are rich in indoles and isothiocyanates, which protect us against colon and other cancers. Broccoli sprouts have been reported to contain 10 or more times as much sulforaphane, a cancer-protective substance, than does mature broccoli. A higher consumption of green leafy vegetables has been shown to significantly decrease the risk of breast cancer and skin cancer…..
Quercetin is a bioflavonoid found in leafy green vegetables. Quercetin has an antioxidant and anti-inflammatory activity and displays unique anticancer properties…..Green, leafy vegetables provide a great variety of colors from the bluish-green of kale to the bright kelly green of spinach. Leafy greens run the whole gamut of flavors, from sweet to bitter, from peppery to earthy. Young plants generally have small, tender leaves and a mild flavor. Many mature plants have tougher leaves and stronger flavors. 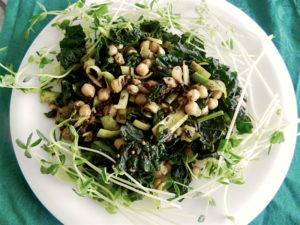 Collards, Swiss chard, bok choy, and spinach provide a mild flavor while arugula, mizuna and mustard greens provide a peppery flavor. Bok choy is best known for use in stir-fries, since it remains crisp, even when cooked to a tender stage. One should always choose crisp leaves with a fresh vibrant green color. Yellowing is a sign of age and indicates that the greens may have an off flavor. Salad greens provide a whole range of important nutrients and phyto-chemicals to keep us healthy. “Dried beans or legumes are an inexpensive and healthy way to include into your 5-A-Day diet. A serving (1/3 cup of cooked beans) contains around 80 calories, no cholesterol, lots of complex carbohydrates, and little fat. In addition, beans are a good source of B vitamins, potassium, and fiber, which promotes digestive health and relieves constipation. Eating beans may help prevent colon cancer, and reduce blood cholesterol (a leading cause of heart disease). Here is a list of (dry) beans from a chart from the American Red Bean Board on this site. The chart provides a nutritional profile for each of the beans: baby & large lima, black, black eye, cranberry, garbanzo (chickpeas), great northern, navy, pink, pinto, red kidney, and small red beans (ex. aduki beans es). Since I am using garbanzo beans for the recipe, here is a nutritional profile from that chart: one cup equals 270 calories, 46 grams of carbs, 14 grams of protein, 6 grams of fiber, 28% of calories from fat, and significant amounts of folate (folic acid) and calcium with only 10 mg of sodium. Note: Many people find beans cause gas, so my answer is to buy them dried and sprout them. The sprouting seems to help with digestion. Culinary Tidbit: When I was at my younger daughter’s last month, she introduced me to fresh garbanzo beans, which grow singly in a pod (right>>>) and are green (See below right). The tan ones on the left are dried and soaked. Not sure why they lose their green color. Anybody have the answer? For a greatarticle on fresh garbanzos, go to http://www.shockinglydelicious.com/introducing-fresh-garbanzo-beans-the-new-edamame/. This entry was posted on Tuesday, March 14th, 2017 at 3:53 pm	and is filed under Home Page, Kitchen Nutrition. You can follow any responses to this entry through the RSS 2.0 feed. You can skip to the end and leave a response. Pinging is currently not allowed.